Lomas de Lachay with Paraiso or Ventanilla lagoons. Some are set departures, but also on demand. After an early start from Lima you will be entering Lomas de Lachay reserve 105 km north of Lima. These coastal hills are an oasis in the desert, seasonally covered in a fog-bank that provides water for annuals and xerophytic plants like cactus and agaves. 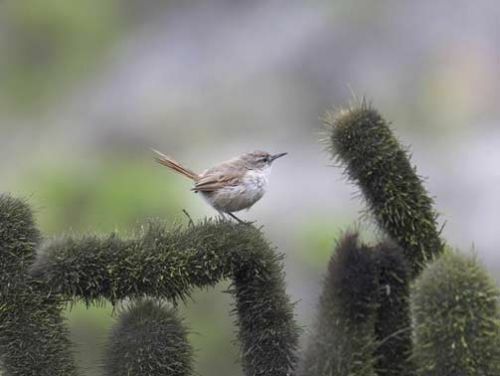 Many very special birds can be seen such as Cactus Canastero, Thick-billed, Coastal and Grayish Miner, Ramondi's´s Yellow-Finch, Least Seedsnipe, Collared Warbling-Finch, Tawny-throated Dotterel, Masked Yellowthroat and many more species are possible at Lomas de Lachay. Continuing North for another 30 km and then drive on a poor road towards the sea, one gets to Paraiso beach. Paraiso lagoon is a place where the rare Peruvian Tern sometimes breeds. In recent years the tern has been scarce here, and a far better site for it is either Paracas or very reliable near Puerto Etén south of Chiclayo. The same species is also frequently seen on pelagics, but not as reliable. 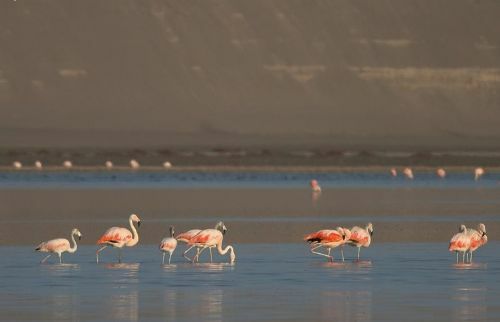 Paraiso is also a haven for wintering shorebirds and there is quite large colony of wintering Chilean Flamingos. The trip to Paraiso does involve a fairly long detour and takes you a long way from returning to Lima. If you don't want to arrive to Lima very late, or perhaps have a flight to catch in the early evening it is far better and safer to instead bird Ventanilla lagoon closer to the airport with both marsh and beach for racking up an impressive list for the day in less time. The lagoon has a tower and one can see White-checked Pintail, Andean Duck, Cinnamon Teal, Pied-billed Grebe, White-tufted Grebe, Black-necked Stilts, Many-colored Rush-Tyrant, Wren-like Rushbird, Gray-headed Gull and Black Skimmer. Between September-April it is excellent for shorebirds including Stilt Sandpiper and Hudsonian Godwit, and there are often a few over-summering Greater and Lesser Yellowlegs and other shorebirds other times of year. Closer to the beach there are flats good for Peruvian Thickknee (very reliable here), Peruvian Meadowlark, Grassland Yellow-Finch, Yellowish Pipit and sometimes Black Rail (murivagans ssp).